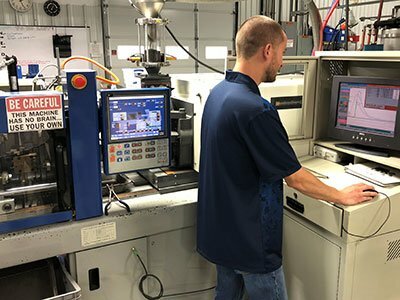 With sufficiently high volumes (often greater than 10,000/campaign), injection molding of finished complex components is the most cost-effective conversion process. This process is multi-phase; melting the resin, “injecting” the molten polymer into a custom cavity of a mold that is in the final shape of the component to be produced, and lastly cooling the component until rigid. These molds, or tools, can be very expensive, but are highly efficient in producing large volumes of finished components. Complex tooling generally costs greater than $10,000 and the more complex the finished component, the higher the cost of the tooling. Therefore, deciding to injection mold a component is typically a balance between volume and tooling costs. Injection molding eliminates machining time and material waste resulting in the lowest possible unit costs and is an appropriate choice when machining presents difficult to overcome geometric challenges. High-performance polymers, and especially PEEK, are readily processed using injection molding. This has contributed to wide acceptance of these polymers in high volume commercial applications. 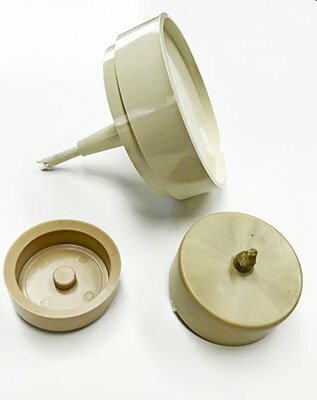 Drake Medical Plastics designed our injection molding capabilities to meet the needs of medical and life science markets. We operate in a clean environment and only use electric injection molding equipment to eliminate oil and the potential for component contamination. Our extensive experience processing high-performance polymers like PEEK and Radel enable us to offer a wide range of specialty capabilities that include in-cavity process control, zero draft, heavy cross sections, selective fiber orientation and precision tolerances. Hot runner capability is offered depending on application and material requirements. Injection molded shapes can be an excellent option as starting ‘near-net shapes’ for complex component configurations where standard fabrication from polymer stock shapes would be significantly more expensive, difficult to manufacturer and time-consuming. This essentially balances precision fabrication with more cost-effective finished injection molding. Some projects may not be realized without this capability because machining from a traditional stock shape may result in such a poor machining yield that the project is not financially viable. Additionally, the project volume, even once commercialized, may not be high enough to justify the complex and expensive tooling required for finished injection molding. Therefore, the choice between precision fabrication, injection molding of a finished component, or a combination of the two via injection molding of a shape and subsequent fabrication is typically not easily addressed since none are clearly superior. Component complexity and the unique requirements of each application will drive which process is best for the given requirements. Project and design engineers should closely evaluate process selection and review the complete requirements upfront with the component supplier before the final device is designed. Also, sometimes an application will start with precision fabrication and subsequently transition to injection molding as volumes increase with commercial ramp ups. Drake Medical Plastics developed all three process capabilities so that we can offer the widest range of cost-effective processing solutions to the medical and life science markets.